The Smoke Filled the Room instead of the Chimney! Moving house is said to be one of the most stressful things anyone can experience in life. All our belongings are removed from the previous house. There are boxes still to be opened and sorted. I think what drains my energy is deciding what to keep, what needs passed on, or where is the new place for each item. I was exhausted and we decided to take a day off from work. There are different jobs that need sorted. Thankfully different workmen have helped us beyond the call of duty. There are two window blinds that need new chains for them to be used. In town we saw a van with the words “Genesis Blinds”. I said perhaps he could call over and replace a chain for us. The owner of the van was working in a house nearby. I popped my head round the door and said “Is the blind man here?” The workmen all looked at me. I laughed. I looked over to a man who was working at the window. I said “Are you the blind man. I need someone to put a chain on my blind.” He wasn’t amused. He said “You need to make an appointment for someone to call out.” Some day we will get the blind fixed. The most recent snag was a chimney that needed cleaned. There had previously been a gas fire in the living room. It was removed to leave an open fire that will burn wood and coal. I like direct heat and a blazing fire is welcoming on a cold night. I couldn’t wait to get a fire lit in my new house, and take a rest from unpacking. I tried a firelighter and a few sticks to start off. After a few minutes smoke started to fill the room instead of going up the chimney. Thoughts of “Why didn’t we leave the gas fire in” came to mind. We wouldn’t have all this bother. The fire alarm went off and there was upset and frustration for a while. There must be some blockage up the chimney. When one is trying to restore something there are always a few obstacles to overcome. This fireplace may not have been used for twenty years! We left the idea of a fire for another day. A father has many coats to put on. 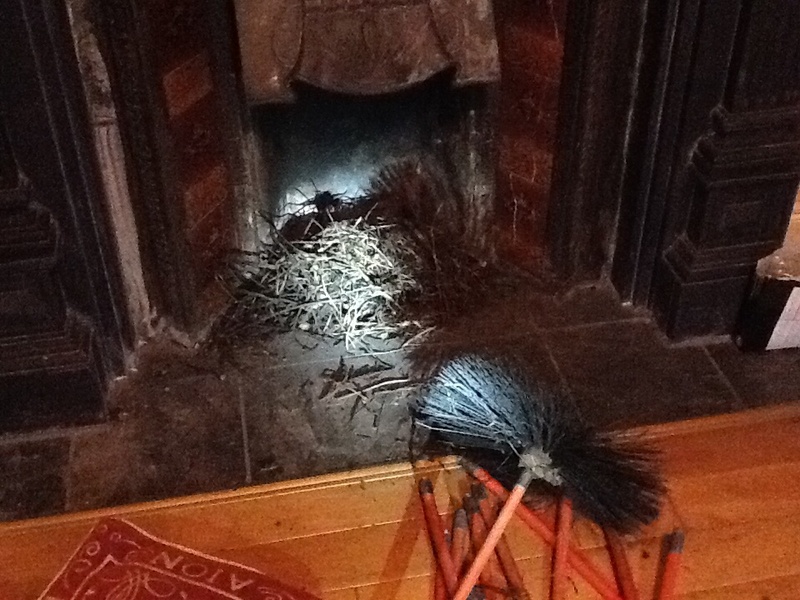 Yesterday my husband became a chimney sweep. He cleared away the debris of a nest that crows had built at the top. There was no soot, just twigs and straw. This evening we are going to sit by the fire and put our feet up and de stress. Wish you were here.